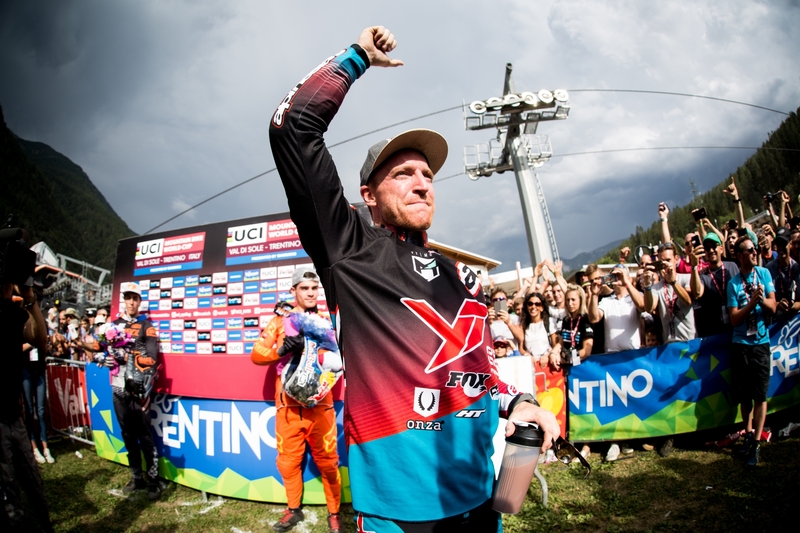 AARON GWIN WINS THE 2017 UCI MOUNTAIN BIKE WORLD CUP! 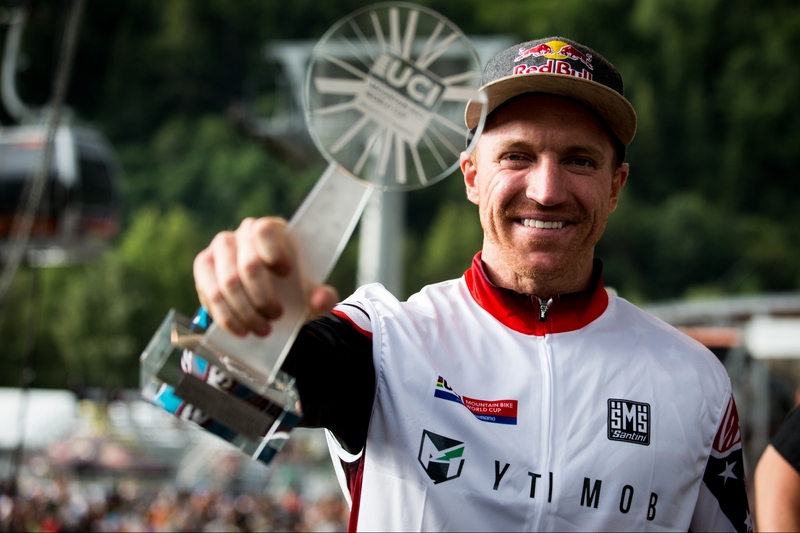 Aaron Gwin overcame the pressure of a tight points race at the final round of the 2017 World Cup to go on to successfully defend his 2016 World Cup title, and make it two-for-two for The YT Mob. Aboard his 2017 TUES CF Pro Race, the American essentially needed to finish ahead of series leader, Greg Minnaar (RSA) by at least 2 positions, or take the win in the final race, to secure the title. On the steep and ever changing gnarly track here in Val Di Sole, in Northern Italy, the margin between these two great riders had come down to a mere 23 points before race day. This was after a tumultuous season that saw both riders have a disqualification for going off course in wet conditions, and both suffer mechanicals that ruined race runs, yet still find themselves at the top of the table. Both Aaron and Greg also had Troy Brosnan (AUS) breathing down their necks within striking range of taking the title. In the first tight three way battle for the men’s title since 2014, it would come down to Aaron just doing what he loves to do best, racing for the win.As the last rider starting, and with the 3m 30secs gaps between riders, Aaron was already in the start house and unaware that Greg Minnaar had punctured and essentially lost the title before the American had even hit the first split. By his own standards, Aaron thought he’d made some errors in the middle of the race that cost him up to 3 seconds and he really felt the battle would be close. It wasn’t until crossing the finish line and seeing P1 on the scoreboard that it had sunk in….overall win number 5 in his career. Well what a crazy World Cup season it’s been. We’ve battled hard through the ups and downs all year and because of that, I can say that winning this one feels the sweetest to me. Thank you to all of our sponsors, fans and supporters for the love this year….so happy!! By winning his 5th Overall World Cup title and 19th World Cup race, Aaron Gwin is edging ever closer to new records in the sport. Only he and the great Nicolas Vouilloz have won 5 World Cup Overall Titles in Downhill. Like Vouilloz, Aaron has won 3 World Cup overalls in a row (2015, 2016, 2017), and his total of 19 race wins comes in just 7 seasons (Vouilloz won 16 races in 8 seasons). With some outright records tantalizing close, the 2018 season will be a big one for Aaron Gwin. Now the team heads to Australia for the 28th World Championships being held for the 2nd time in Cairns. Until now Aaron’s best result is 4th at the World Championships so he’s keen to take home some precious metal this time around. Tune in for that race, September 10th. 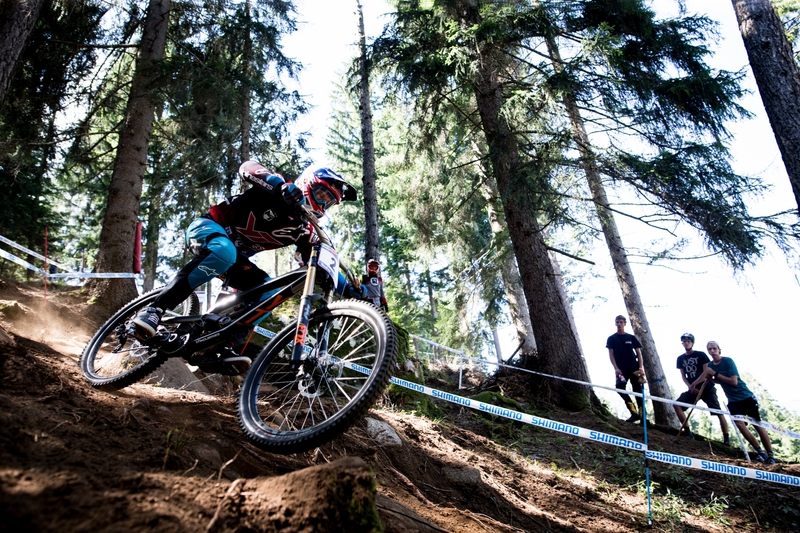 Check out the team’s latest video from Val Di Sole here.